It's that time of year again. 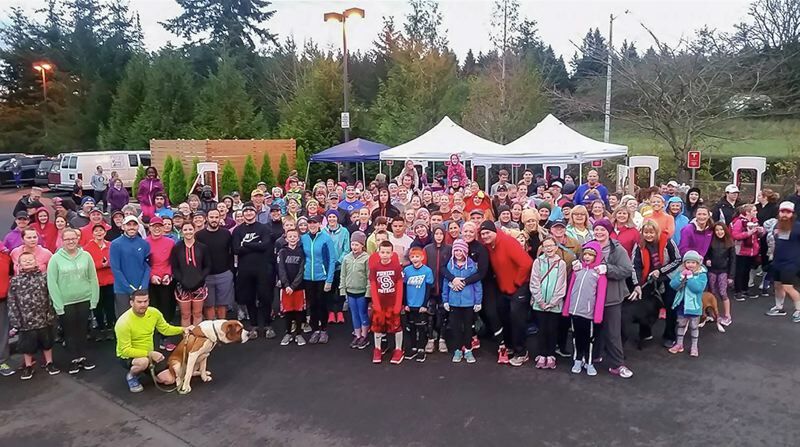 At 8 a.m. on Thanksgiving morning, Nov. 22, all are encouraged to walk, run or trot down to the Sandy Fred Meyer, 16625 S.E. 362nd Drive, for the seventh annual Tickle Trot 5K. Unlike most other 5-kilometer runs, the Tickle Trot registration is open to all with a monetary donation in an amount of your choosing. All proceeds benefit the Sandy Community Action Center, which feeds approximately 300 families per month throughout the year from its food pantry at 38982 Pioneer Blvd. There aren't complimentary kits or T-shirts, but every participant walks away with the reward of knowing their donations will help feed and aid local families. "It's a good fundraiser for us because the overhead is really low, but the spirit is really good," Sandy Community Action Center Director Kirsten Pitzer said. "It's a fun family, pet-friendly event." Costumes are welcome at the Tickle Trot, which will start at the Fred Meyer store's garden center parking lot at 16625 S.E. 362nd Drive, on Thanksgiving morning. The route is dog and stroller-friendly. Day-of registration and donations open at 7:15 a.m., runners start at 8 a.m. and walkers take to the route at 8:15 a.m. Registration is available online at www.tickletrot.com, and participation is by donation. For more information, contact the Tickle Trot 5K Facebook page at www.facebook.com/tickletrot/. "I promise by saying 'you do this first, you can eat whatever you want after,'" Pitzer added.